Del Bosque Mushrooms has only been selling the produce since November last year, and owner Enrique Perez says there has been some very positive feedback from those who have tried the different varieties for the first time. "What we found with the farmers market is, there's a lot of education to be done, and people are willing to taste them and keep coming back," he said. "New Zealand can be quite conservative with their range and they have been used to the field mushroom. So, it's good for people to know there are different varieties and hopefully we can get better at knowing the uses. 90 per cent of the people come back really happy, because all they knew was the button mushroom from the supermarket. The only negative feedback we've had is the people who want it to be the same - but it is not. But in general, it has been a great response." Mr Perez is a Mexican agronomist and the company grows the mushroom spores in a basic laboratory which was set up in 20-foot shipping container, with another two growing containers. Mr Perez says demand was the reason behind starting the mushroom production. "I have a friend who is a chef and he struggled to find mushrooms in Gisborne, and I guess they were quite expensive and no-one was doing them," he said. "So, I saw a gap and went for it. We have one growing room in a 20-foot container, and we have recently got another in a 40-foot. They are insulated shipping containers, or ex-refrigerated, and we fit them with air conditioners, lights, timers, humidity devices and fans - just to create the right conditions." While Mr Perez has strains to grow up to 10 more varieties in the future, Del Bosque is currently only producing two - pink and white oyster mushrooms. "We are just quite limited to what we can grow in New Zealand," Mr Perez said. "Because of biosecurity, there is only 10-15 different species that are allowed in the country, so we are only growing what is in the country, and what we can get our hands on. I have 10 strains in the fridge, so that is what we can look at growing." 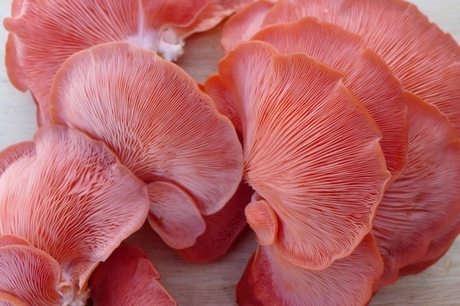 He adds the pink and white oyster mushrooms have similar flavour, but textural differences. "They are both good for frying up, or using in stews, especially the pink ones, which keep their colour - so they are good in soups," Mr Perez said. "They are both good meat substitutes and good in beef dishes, gravy, pizzas, pasta and omelettes. Anything really." 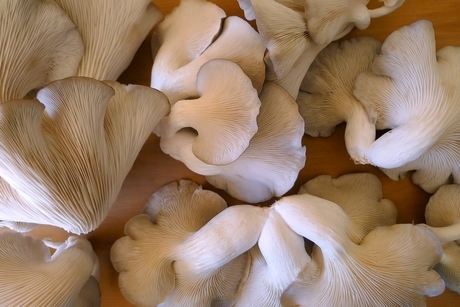 While Del Bosque is the only mushroom grower in the area, there are other smaller growers in other parts of New Zealand, with only one or two major growers supplying the supermarkets. Over the past few months, company has produced between 20-30 kilograms per week, and mainly supplies the farmers markets and restaurants - but Mr Perez says he is not aware of any other company growing the pink variety commercially. "We recently started selling to Farro Fresh, the supermarket in Auckland," he said. "But there are more shitakes than oysters (on the market), and not many pink oysters. So, it’s a good gap and a good opportunity that we have found. We are currently looking for more outlets, we are just in the growing phase, so there is room for more supply. Once we get to full production, with the current setup, I am hoping to get to 90 kilos a week."